The scene of 13 people falling out of Air Force One is, surprisingly, the least interesting scene in the film. But it's a scene that symbolizes the whole movie. It's about people being thrown into a dangerous situation with no protection and no safety net and surviving. The film succeeds by taking the characters, breaking them down and rebuilding them. In the end, it's the movie that proves Tony Stark deserves to be a superhero. Iron Man 3, also known as Iron Man Three, is a 2013 superhero movie directed and co-written by Lethal Weapon screenwriter Shane Black. It's the second sequel to Iron Man and the seventh film of the Marvel Cinematic Universe, so it carries a lot of weight. Like the film, Tony Stark (Robert Downey Jr.) feels the weight of the world and is struggling to hold all of that up. He's been through some amazing experiences and come out alive, but is slightly broken. In the middle of this come the ultimate terrorist known as "The Mandarin", played by Ben Kingsley, who is determined to bring down America by a series of mysterious explosions around the nation. Stark is left fighting to protect himself, his love Pepper Potts (Gwyneth Paltrow) and figure out the role of evil scientist Aldrich Killian (Guy Pearce) head of Advanced Idea Mechanics. A.I.M. is working on a dangerous technology, called "Extremis", that can repair the human body along with Dr. Maya Hansen (Rebecca Hall), who Tony "met" briefly back in 1999 (Wink Wink Nudge Nudge). Every character in the film has been rebuilt. Robert Downey, Jr. comes back as Tony Stark who's dealing with Post Traumatic Stress from the attack on New York. Tony Stark has always been bold and brash, but in this film he shows his weaknesses and rebuilds himself. Most of the film is spent without his armor, and his vulnerability makes his character much stronger. Pepper Potts has her best moments in this film. She takes center stage and becomes a key player in the fight scenes and not just the "Damsel in Distress." The director of the last two Iron Man films, Jon Favreau, stars in the film as "Happy" and his new role as Head of Security at "Stark Industries" makes him much more important than just a bodyguard. Don Cheadle returns as "Iron Patriot" (formerly "War Machine"), and is trying to figure out how to work for the government and stay Tony's friend. He even manages to show his shooting skills and fight training. Ben Kinglsey got a standing ovation from the film crew after one scene and I felt like doing the same. It's a brilliant performance. Guy Pearce, Stephanie Szostak, James Badge Dale play villains that have literally rebuilt themselves and are single-minded in their plans. Stan Lee does his obligatory cameo in the film. The scene with Tony rescuing people falling thousands of feet from an airplane is great, but it's the emotional scenes that are the stars in this film. Directed by Shane Black, it has a different feel than the other films. Gone are the hard rock guitar riffs. There's a softer tone to the film and it feels less like an action movie and more like a character study. Not to say it has less action. Some of the biggest scenes are the fight scenes with dozens of Iron Man suits and the Extremis soldiers, and rescuing. It's just that the action scenes aren't the scenes that are the most memorable. The scenes with Pepper and Tony. The Mandarin's speeches. Tony stuck in a small town befriending a young boy named Harley (Ty Simpkins) - whose name is a thin reference to the advertising partnership with Harley-Davidson. These are the scenes that make the film. A couple of my friends said this film is better than the last two. I disagree, but do think it's the movie that makes us draw closer to Tony Stark and is the best movie to take Stark and prove he's not just a guy with a cool suit. He's a real hero. My only complaint is a plot twist that makes us rethink what we think about the villains and destroys over thirty years of comic book history. Other than that, it's a great film. It's not as good as Iron Man or Iron Man 2, but it's still great. What do you think of Iron Man 3? Will you see it? If you've seen it what do you think? i felt a good vibe from this film, i went out right after and got "kiss kiss bang bang" directed by black and staring downey... it was an eye opened experience. there are many same traits between both and black's signature is all over this and then transfers to iron man 3. i felt without sharing to many if no spoilers.... it was the same feel of "dark night rises"... it wasn't about stark being iron man, it was more about stark being stark... and that was achieved. I'll probably see it at some point. I hadn't realized Black co-wrote "Lethal Weapon" though I did know he wrote/direct "Kiss Kiss Bang Bang" which starred Downey shortly before his comeback with Iron Man, which seemed to me the reason he probably got this directing gig after Favreau stepped down. The Lethal Weapon experience showed in the film - great action sequences. Glad it's a good movie. I'll definitely see it. I loved this movie and it was far superior to IM 2, you have to admit that one was too much set up for Avengers. 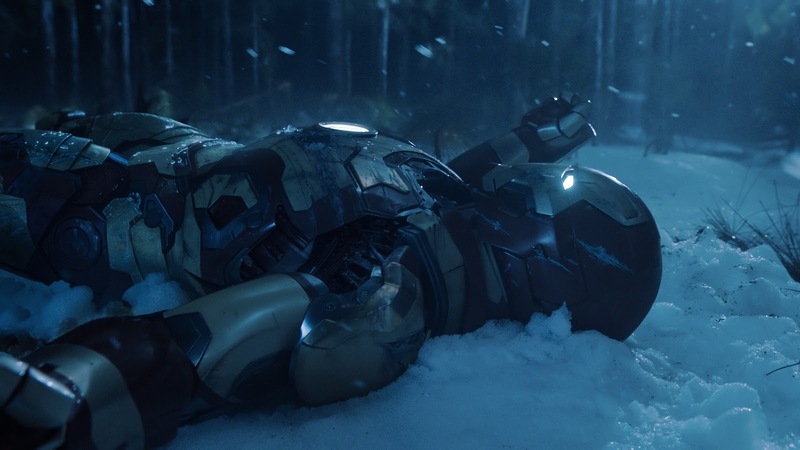 I did like the softer side of Tony Stark as well as the action sequences, particularly when all the suits showed up. Terrific review! It's definitely worth watching MPax. But Avengers was awesome! Yeah, Melissa I know some didn't like IM2, but it still works for me. I hope they don't replace Robert Downey Jr. Would you watch it without him? It's all about who you know Pat, but he did a great job. I'll have to watch that film sometime Jeremy! I had no idea they had anything in common. Stark becoming Stark. Well said. They were god Alex, I never thought to compare them but the LW films had some insane action scenes. I guess I should say that IM3 is a great film. I guess it was just a different feel and a different tone than the other ones. Themes of terrorism and genocide were new and the overall feel was much more grounded than the other two. Lots of people I've talked to think this one is better than IM2 which is a fair point. The trilogy of films are solid and don't have the usual lag in quality from 2 to 3. This film explores his inventive side in many ways, which I think you'll enjoy Tony. Proving that it's not just the suit that makes him Iron Man.